I love some of the recent cake trends that have been filling my Pinterest feed, and have been waiting for a chance to have a go at some. So when I was given free reign on a birthday cake recently, I took my opportunity to try out two popular themes. 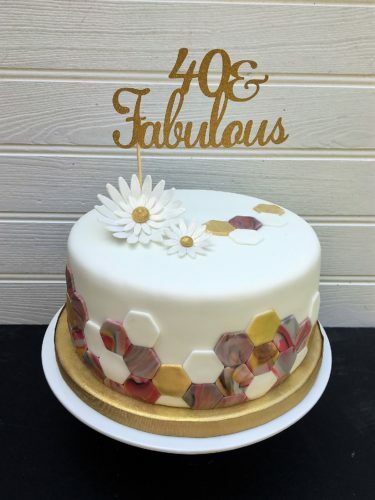 Geometric patterns have been a fashionable choice on both wedding and birthday cakes in recent months, as has combining different sugarpaste colours to create a marbled effect. I wanted to utilise both of these elements in my design. 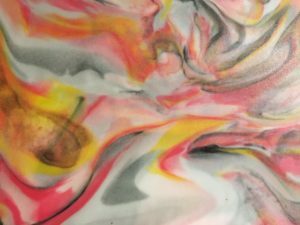 The cake was covered in white sugarpaste, and I marbled another batch using shades of grey, yellow and pink. 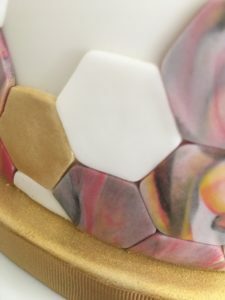 Using this, I cut hexagon shapes to decorate the sides of the cake. I varied the quantities of the colours I was using, as well as the size of the pieces I put together to create the marbled effect. By choosing to keep each piece fairly small, I was able to make the pattern more detailed, with plenty of veins of colour in the marbling. To add some highlighted accents to the design, a few of my hexagons were painted gold, using Rolkem lustre dust, which is my new favourite thing. I also used it to paint the cake board as well as the centres of the sugarpaste flowers I added to the top of the cake. The cake was finished off with a topper from Leanne’s Little Gift Company, who I have ordered from a few times now, and found her to be fabulously helpful and reliable each time.